Lucy Oldfield was one of the outstanding ladies to have worked for the glass industry. She was educated at Harrow County School for Girls and Bedford College (London University) gaining a First Class Honours Degree in Chemistry in 1947. She worked as an analyst for British Drug Houses in London and was then accepted as a post graduate research student at Imperial College (London University), being awarded a PhD in 1952 for her research in electrochemistry. She had completed her practical work and most if not all of her thesis when she joined GEC Research Laboratories in November 1951. At the time Dr J. H. Partridge was absent for several long periods due to ill health and R. W. Douglas was ‘keeping an eye’ on the Glass and Refractories Group. Although he was mainly concerned with research in solid state physics: it was Douglas who actually engaged Lucy. Shortly after her arrival Dr F. S. Hawkins took charge of the Glass and Refractories Group with both Douglas and Partridge in advisory capacities. Douglas was appointed Professor at the Department of Glass Technology, Sheffield University, in 1955 and Partridge continued to take an active interest and was fully involved until a few weeks before his death in 1956. Her first job was to try to isolate and identify the defects in TV tube components being manufactured on a Lynch press at the GEC Lemington Glassworks. Lucy's primary interest was in the structure of glass and in the relationship between composition, structure, and both physical and electrical properties; this Lemington problem with a glass containing fluoride was a most appropriate introduction. It was possibly her work on borosilicate glasses that brought her international recognition, and her work on glass-to-metal seals followed the long tradition of interest in this subject in the Glass and Refractories Group at Wembley. 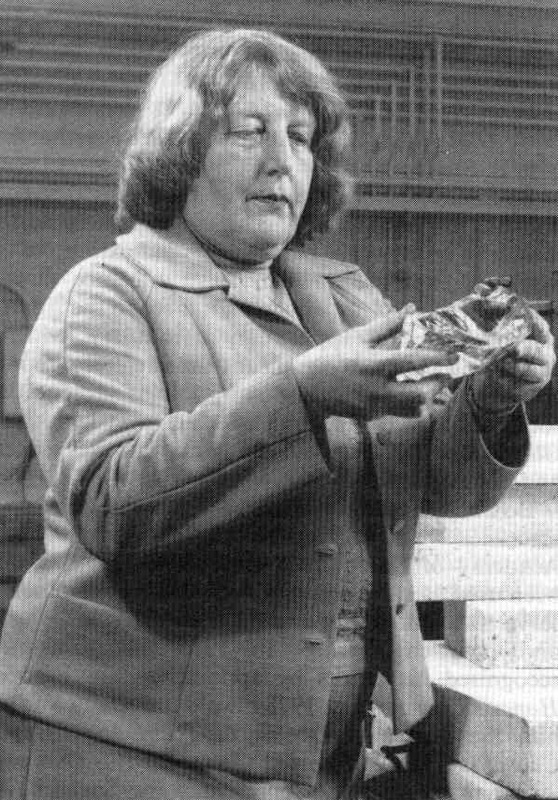 Lucy joined the Society as a Personal Member in 1958, was awarded the Fellowship in 1965, and in 1967 was the second recipient of the London Section’s Redston Award. She served on the Board of Fellows from 1970 to 1975, on Council for two periods, 1959-1962 and 1966-1969, and as a Vice President in 1969-1972. She was Chairman of the London Section in 1960-1961 and served on the Committee for twelve years, a member of the Basic Science and Technology Committee from its inception, and a member of both the Physical Properties Committee and Chemical Analysis Committee for a number of years (these committees have now merged to become the SGT Analysis and Properties Committee). She also represented the Society on BSI Committees dealing with street lanterns and electric lamps and on the City and Guilds of London Advisory Committee for the glass manufacturing and process industries. Lucy was fascinated with glass in all its aspects and her enthusiasm for the subject was matched by her ability to communicate that fascination and all that it implied and to make intelligible to all sorts of people some of the more difficult concepts concerning glass and the glassy state. It was this that led her to take up the challenge of establishing a syllabus on glass science and technology, subject to examination, at Isleworth Technical (later Hounslow Borough) College. Many members of the British Society of Scientific Glassblowers will remember her skills as a lecturer and instructor at the College. Anyone genuinely seeking information and willing to learn was treated with interest, patience, and kindness; and, unlike many theoreticians, she was excellent in experimental work and trained others to be just as meticulous.